ON NOVEMBER 1, 1957, IN LONG REACH, PICTON, ONTARIO, HISTORY WAS MADE. THE BOAT THAT WOULD ACCOMPLISH THIS FEAT WAS CALLED MISS SUPERTEST II. ACROSS THE WATER, ACHIEVING A SPEED OF 184.54 MILES PER HOUR! The photo is of Mrs. Ellerington and Don Payne the boats restorer, last year at Heritage Day here at the Dorset Heritage Museum.Mrs. Ellerington’s husband Bill worked on this boat with a group of men, one being Art Asbury the driver of it at the time, and Don’s father! They worked on it in a work shop located at the Ellerington’s home, which is next door to the museum. 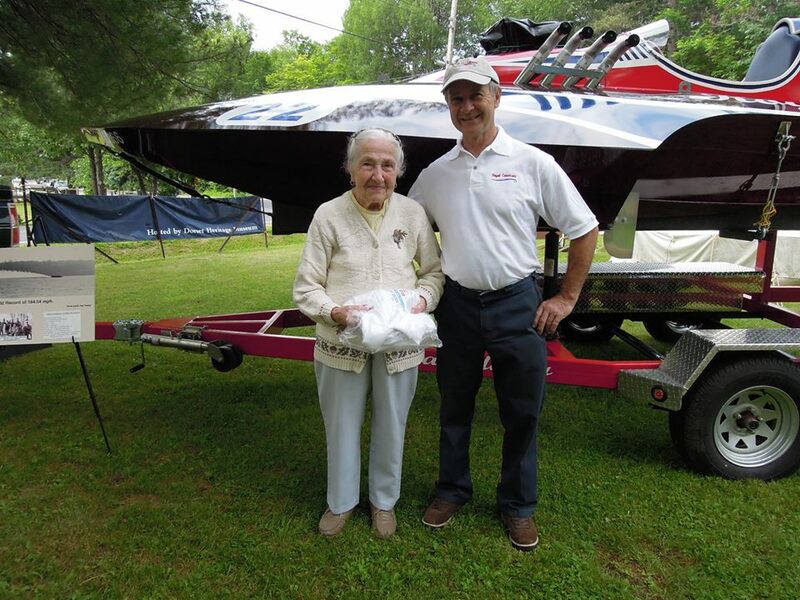 Don was very happy the she came over to see this beautifully refurbished hydroplane that her husband and friends had once worked on and raced in the 60’s. On Heritage Day, July 2, 2016 at the Dorset Heritage Museum the boat in the photo, one of Art’s, will be on display.